Development of theory and methodology of novel geophysical techniques to map the physical properties of the Earth's crust and near-surface economic zone beneath the oceans and shallow shelf seas. ARCS, Imperial College (1966); BSc(Special), London (1966); Royal Dutch/Shell Open Scholar, Cambridge (1966-69); PhD, Cambridge (1970); Postdoctoral Fellow, Toronto (1970-71); Research Geophysicist, Scintrex Ltd (1971-72); Appointed Assistant Professor, Toronto (1972); Cecil and Ida Green Research Foundation Scholar, IGPP, UCSD (1986); Research Associate, Scripps Institution of Oceanography (1986-88); Professor, Division of Engineering Science (1987-91); Associate Chair, Undergraduate Studies (1990-1994); Professor, Tokyo National University and Research Fellow, Earthquake Research Institute (2000-2001); J. Tuzo Wilson Professor of Geophysics, Toronto, (2007-present). Marine Electromagnetic Methods Accepted for Exploration! Twenty years ago, we wrote that while electromagnetic exploration of the solid earth had advanced substantially in academic circles, the adoption of the technology by oil and gas companies was slow. Up until 2000, little changed even though Jian Yang and I had published the first offshore survey which mapped and assessed a significant hydrocarbon deposit. Commercial exploration was indeed proceding from the continents offshore into progressively deeper water and the continental shelves had became a focus for intense 3D seismic activity. Further, the success of the seismic approach alone was evident by the level of offshore drilling activity and the subsequent production of oil. However, there are marine geological terranes in which the interpretation of seismic data is difficult. In other locations, seismic methods may be environmentally discouraged. In this case, complementary geophysical techniques should be part of a comprehensive exploration strategy. The tide turned when a few surveys commissioned from universities proved very successful and in less than five years, exploration managers and investors have become aware of the importance of the science and the extensive literature. Now new highly successful contracting companies have been formed including OHM, based in Aberdeen, Scotland, which has its origins at Southampton University, UK, and EMGS, a spin-off company of Statoil, based in Norway, who learned their skills from Southampton and the Scripps Institution of Oceanography, San Diego, USA. In an investors advisory, Morgan Stanley assess the the implications of controlled source electromagnetic imaging (CSEMI) on offshore drilling, service, and field development activity will be one of the most frequently discussed topics in the oil service industry over the next twelve months. They see a growth in annual revenues from a mere $30 million to $600-900 million in less than five years - one quarter of the current spending on offshore seismic - and compare the technological revolution with the growth of 3D seismic in the early 1990s. The intense competition between contractors has generated a deluge of patent but some of these are academically fraudulent and of highly questionable legal value. My group continues to concentrate on development of novel marine electromagnetic methods from invention, through theory, experimental design, construction of suitable equipment and the collection and interpretation of marine data. The funding for the work has improved greatly through the support of commercial organisations. The current state-of-the-art and our contribution to it is summarised in review paper by Edwards(2005). 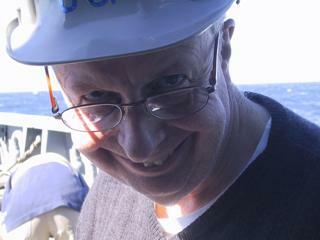 One target of particular interest to the group is the mapping and assessment of Gas Hydrates. By way of example, consider the survey off the west coast of Vancouver Island, Canada presented by Schwalenberg et al (2005). Natural gas hydrates are ice-like solids that occur worldwide in sea floor sediments along continental margins. 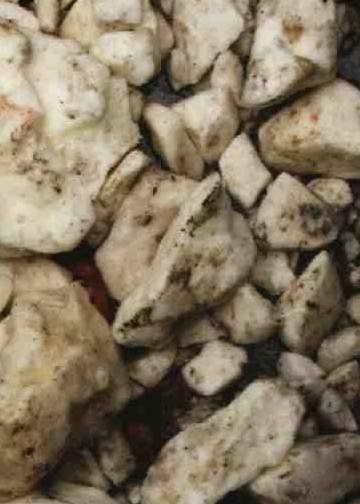 They consist of gas molecules, mainly methane, contained in a cage-like clathrate structure of water molecules. They form under low temperature and high pressure conditions, typically in the uppermost few hundreds of metres of sediments in water depth exceeding about 500 m. The global abundance of methane frozen in hydrate exceeds the amount of all other known fossil hydrocarbon resources. Hydrate clearly has a huge potential as a future energy resource. A gas hydrate deposit can be generally identified in a seismic section as a seismic reflector whose topography mirrors that of the sea floor. It is associated with the base of the hydrate stability field, a transition zone between hydrate bearing sediments above it and free gas and water below it. The location of the zone is temperature controlled and depends on the ambient geothermal gradient. 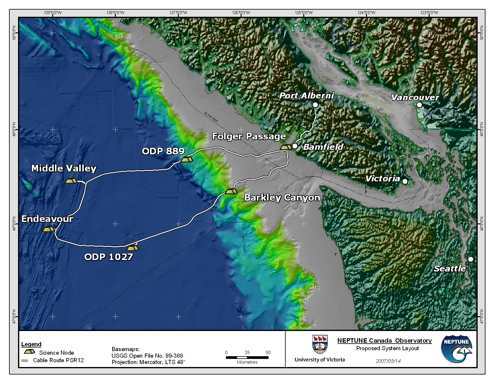 Bullseye is one of many large deposits of hydrate existing off the west coast of Vancouver Island. Logs from a hole drilled through it by the Ocean Drilling Program (IODP) Expedition 311 confirm the existence of hydrate layers in the first few hundred meters of sediment. In some locations, the hydrate layer exists at the seafloor itself and it has been recovered from there by local fishers. 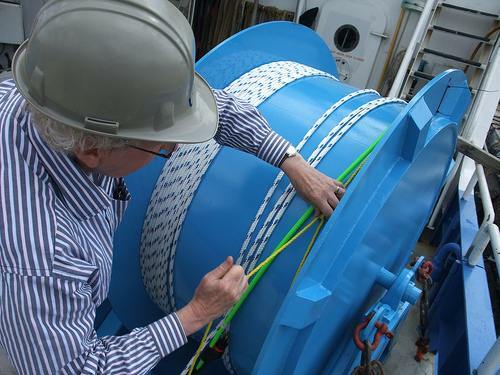 Long-term Monitoring of Bullseye Vent with NEPTUNE Canada NEPTUNE Canada is a permanent, cabled, seafloor observatory, providing power and internet to time series instruments at nodes offshore Vancouver Island, including the Bullseye Vent. Since gas hydrate increases both the resistivity and stiffness of marine sediments, we have deployed two stationary semi-permanent imaging experiments: Controlled-Source Electromagnetic (CSEM) and Sea Floor Compliance (SFC). You can learn more about these projects from watching this presentation. The hydrate project has been the subject of several national and international newspaper articles. It is well funded by grants and student fellowships from NSERC, NEPTUNE Canada, GSC, J. Tuzo Wilson Chair Research Fund and the Ontario Government (OGS). Research has been funded by Shell International Exploration and Production Inc., support from Fugro and in-kind donations from Scintrex Ltd. and mico-g Lacoste. From time-to-time we have joint projects with Woods Hole Oceanographic Institute, Scripps Institution of Oceanography, the Schwalenberg Institute, GEOMAR and the Geological Survey of Canada. There are opportunities for students and Post Doctoral Fellows to join the marine group to work on short-term projects. The projects available span a field from geology through theoretical classical physics to applied electrical engineering. Graduates are eagerly sought by Universities, Government Laboratories and Commercial Organisations worldwide. We require a strong undergraduate education in Classical Physics and Applied Mathematics. Lisa Roach (PhD in progress) "Temporal Variations in Compliance of Gas Hydrate Formations"
Andrei Swidinsky (PhD in progress) "Transient electromagnetic modelling and imaging of thin resistive structures"
Ele Willoughby (PhD 2003) "Resource Evaluation of Marine Gas Hydrates using the Compliance Method"; NSERC Visting Post Doctoral Fellow in a Government Lab, Pacific Geoscience Centre (NRCan); Research Associate, University of Toronto. Jian Yuan (PhD 2003) "Electromagnetic Assessment of Off-Shore Methane Hydrate Deposits on the Cascadia Margin" ; PDF, University of Toronto; Instructor, Ryerson University. Konstantin Latychev(PhD 2001) "Numerical Modelling of Oceanic Crustal Hydrothermal Systems"; Research Associate, University of Toronto. Jianwen Yang (PhD 1997) "Numerical Simulation of Hydrothermal Convection within Discretely Fractured Porous Media with Application to the Seafloor"; Professor, University of Tasmania; Professor, University of Windsor. Liming Yu (PhD 1994) "Computation of Electromagnetic Responses of Mid-Ocean Ridge Structures"; Research Geophysicist, Royal Dutch/Shell, Houston. Mark Everett (PhD 1991) "Active Electromagnetics at the Mid-Ocean Ridge"; NSERC and Green Postdoctoral Fellow, Scripps Institution of Oceanography; Professor, Texas A and M University. Katrin Schwalenberg (PhD 2000, Free University Berlin, Germany); Supervisor, Professor Volker Haak; Die Leitfaehigkeitsstruktur der Zentralen Anden bei 21 S: Zweidimensionale Modellstudien und Untersuchungen zur Aufloesbarkeit; DFG Fellow "Controlled Source Electromagnetic Experiment for Gas Hydrate Evaluation off the Chilean Margin"
E.C. Willoughby, K. Latychev, R.N. Edwards, R.D. Hyndman: 'Seafloor compliance imaging of marine gas hydrate deposits and cold vent structures', Journal of Geophysical Research , 113, B07107, doi:10.1029/20005JB004126, 2008. C. Scholl, R. Mir, E.C. Willoughby, R.N. Edwards, 2008. 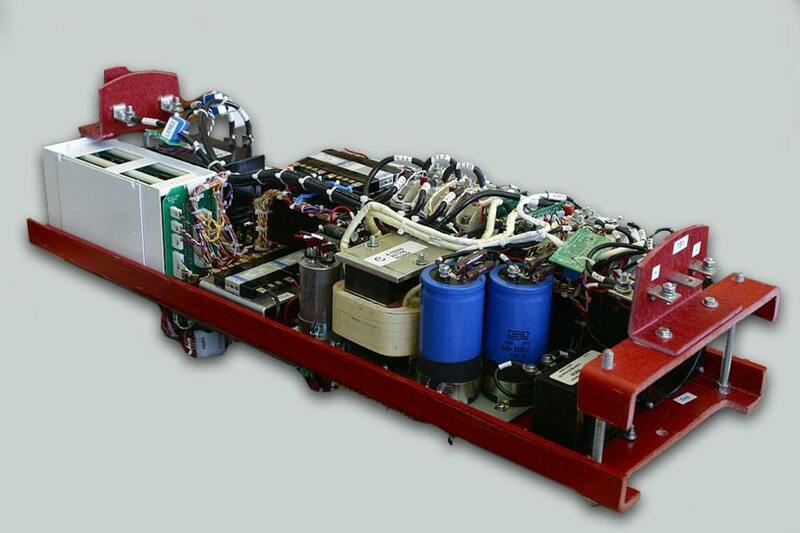 RESOLVING RESISTIVE ANOMALIES DUE TO GAS HYDRATE USING ELECTROMAGNETIC IMAGING METHODS. Proceedings of the 6th International Conference on Gas Hydrates (ICGH 2008), Vancouver, British Columbia, CANADA, July 6-10, 2008. E.C. Willoughby, R. Mir, C. Scholl, R.N. Edwards, 2008. NEPTUNE-CANADA BASED GEOPHYSICAL IMAGING OF GAS HYDRATE IN THE BULLSEYE VENT. Proceedings of the 6th International Conference on Gas Hydrates (ICGH 2008), Vancouver, British Columbia, CANADA, July 6-10, 2008. C. Scholl and R.N. Edwards, 'Marine downhole to seafloor dipole-dipole electromagnetic methods and the resolution of resistive targets', Geophysics, 72, WA39 (2007); doi:10.1190/1.24344775. R. N. Edwards, 'Transient electromagnetic methods for sounding the crust', Encyclopedia of Geomagnetism and Paleomagnetism, David Gubbins and Emilio Herrero-Bervera editors, Earth Science Series, Springer, New York, 2007. R. N. Edwards, 'Marine controlled source electromagnetics', Encyclopedia of Geomagnetism and Paleomagnetism, David Gubbins and Emilio Herrero-Bervera editors, Earth Science Series, Springer, New York, 2007. R.D. Hyndman, G.D. Spence, R. Chapman, M. Riedel and R.N. Edwards, 'Gas Hydrates: Geophysical studies of marine gas hydrate in Northern Cascadia', Geological Survey Canada, Earth Sciences Sector, 2005. R.N. Edwards, 'Marine Controlled Source Electromagnetics: Principles, Methodologies, Future Commercial Applications', Invited Review Paper, 17th Electromagnetic Induction Workshop, Hyderabad, India, 17th - 23rd October 2004, Surveys in Geophysics, 26, 675-700, 2005. K. Schwalenberg, E.C. Willoughby, R. Mir and R.N. Edwards, 'Marine gas hydrate signatures in Cascadia and their correlation with seismic blank zones', First Break , 23, 57-63, 2005. R.N. Edwards and K. Schwalenberg, 'Distortion of sea floor electromagnetic fields by topography', Proceedings of the Fourth Workshop on Marine Electromagnetics (MARELEC), London, March 2004, (preprint available). K. Schwalenberg and R.N.Edwards, 'Marine Controlled Source Experiments to Evaluate Gas Hydrate Deposits off the Coasts of North and South America', Proceedings of the Fourth Workshop on Marine Electromagnetics (MARELEC), London, March 2004, (preprint available). K. Schwalenberg and R.N. Edwards, 'The effect of sea floor topography: An analytic formulation for the magnetotelluric fields in the presence of a harmonic interface', Geophysical Journal International, 159, 607-621, 2004. K. Latychev and R.N. Edwards, 'On the compliance method and the assessment of three dimensional gas hydrate deposits', Geophysical Journal International, 155, 923-952, 2003. R. D. Hyndman, G. D. Spence, R. Chapman, M. Reidel, and R. N. Edwards, 'Geophysical Studies of Marine Gas Hydrates in Northern Cascadia', in Natural Gas Hydrates: Occurrence, Distribution, and Detection, Charles Paull and William P. Dillon, Eds., American Geophysical Union, Geophysical Monograph Series, 124, 2001. Jianwen Yang and R.N. Edwards, `Electric potential arising from a point source near a cylinder in layered earth structures: design criteria for a modified marine heat-flow probe', Exploration Geophysics, 32, 64-69, 2001. J. Yuan and R.N. Edwards, 'Electromagnetic Assessment of Marine Gas Hydrates on the Cascadia Margin', Proceedings of the Third Conference on Marine Electromagnetics (MARELEC), Stockholm, August 2001. G.D. Spence, R.D.Hyndman, N.R. Chapman, M. Reidel, R.N. Edwards and J. Yuan, 'Cascadia margin, northeast Pacific Ocean: hydrate distribution from geophysical investigations', in Natural gas hydrate in oceanic and permafrost environments, Max, M D. ed., Coastal Systems and Continental Margins, 5, 183-198, 2000. E.C. Willoughby, K. Latychev, R.N. Edwards and G. Mihajlovic, `Resource Evolution of Marine Gas Hydrate Deposits Using Seafloor Compliance Methods', in Gas Hydrates: Challenges for the Future, Ann. N.Y. Acad. Sci., 912, 2000. O. Matsubayashi and R.N. Edwards, `Relationship between Electrical and Thermal Conductivities for Evaluating Thermal Regime of Gas-Hydrate Bearing Sedimentary Layers', in Gas Hydrates: Challenges for the Future, Ann. N.Y. Acad. Sci., 912, 2000. G.D. Spence, R.D. Hyndman, N.R. Chapman, R. Walia, J. Gettrust and R.N. Edwards, `Review of North Cascadia Deep Sea Gas Hydrates', in Gas Hydrates: Challenges for the Future, Ann. N.Y. Acad. Sci., 912, 2000. Jian Yuan and R.N.Edwards, 'The assessment of marine gas hydrate through electrical remote sounding: Hydrate without a BSR? ', Geophysical Research Letters, 27, 2397-2400, 2000. Jianwen Yang and R.N. Edwards, `Predicted groundwater circulation in fractured and unfractured anisotropic porous media driven by nuclear fuel waste heat generation', Canadian Journal of Earth Sciences, 37, 1301-1308, 2000. E.C. Willoughby and R.N. Edwards, `Shear Velocities in Cascadia From Seafloor Compliance Measurements', Geophysical Research Letters, 27, 1021-1024, 2000. R.N Edwards, Jian Yuan and G. Cairns, `Electromagnetic Assessment of Offshore Methane Hydrate Deposits on the Cascadia Margin', Proceedings of the Second Workshop on Marine Electromagnetics, (MARELEC), Brest, July 1999. R.N Edwards, and Marion Jegen, `Electromagnetic Impedance Measurements and the Evaluation of Sea Floor Conductivity Structure: A Tutorial', Proceedings of the Second Workshop on Marine Electromagnetics (MARELEC), Brest, July 1999. Jianwen Yang, K. Latychev and R.N. Edwards, `Numerical computation of hydrothermal fluid circulation in fractured earth structures', Geophysical Journal International, 135, 627-650, 1998. M. Jegen and R.N. Edwards, `The electrical properties of a two-dimensional conductive zone under the Juan de Fuca Ridge', Geophysical Research. Letters, 19, 3647-3651, 1998. E.C. Willoughby and R.N. Edwards, `On the resource evaluation of marine gas-hydrate deposits using seafloor compliance methods', Geophysical Journal International, 131, 751-766, 1997. R.N. Edwards and G. Cairns, `Marine electromagnetics and seafloor mineral exploration', Proceedings of First International Conference on Marine Electromagnetics (MARELEC), Imperial College, London, August 1997. Liming Yu and R.N. Edwards, `On crosswell diffusive time-domain electromagnetic tomography', Geophysical Journal International, 130, 449-459, 1997. R.N. Edwards, `On the resource evaluation of marine gas hydrate deposits using a seafloor transient electric dipole-dipole method.' Geophysics, 62, 63-74, 1997. Liming Yu, R.L. Evans and R.N. Edwards, `Transient electromagnetic responses in seafloor with tri-axial anisotropy.' Geophysical Journal International, 129, 300-306, 1997. G. Cairns, R. Evans and R.N. Edwards, `A time domain electromagnetic survey of the TAG hydrothermal mound.' Geophysical Research Letters, invited paper, 23, 3455-3458, 1996. Jainwen Yang, R.N. Edwards, J.W. Molson and E.A. Sudicky, `Fracture-induced hydrothermal convection in the oceanic crust and the interpretation of heat flow data.' Geophysical Research Letters, 23, 929-932, 1996. Liming Yu and R.N. Edwards, `Imaging axi-symmetric TAG-like structures by transient electric dipole seafloor electromagnetics.' Geophysical Research Letters, invited paper, 23, 3459-3462, 1996. Jainwen Yang, R.N. Edwards, J.W. Molson and E.A. Sudicky, `Three dimensional numerical simulation of the hydrothermal system within the TAG-like sulfide mound.' Geophysical Research Letters, invited paper, 23, 3475-3478, 1996. S.C. Webb and R.N. Edwards, `On the correlation of electrical conductivity and heat flow in Middle Valley, Juan de Fuca Ridge.' Journal Geophysical Research, 100, 22,523-22,532, 1995. From time-to-time we release software of interest to our colleagues.The software can be accessed through the address of this web page with the switch /software added to it. This site is maintained by R. Nigel Edwards. Last updated October 2009.